As planned, dad and I began today with a trip to the Marriott breakfast buffet. We had to get up a little early - around 7 - but it was fairly easy and we had a pretty restful sleep after such a busy day. I had some fruit and some other typical buffet items but nothing too crazy. Moderation and thoughtful planning are the keys to success. I brought my leftover fish from last night's dinner and made up about four delicious fish sandwiches and also spread some mango chutney on them. Over the top! After breakfast we packed up the car, checked out of the hotel and drove about 45 minutes south into Islamorada to meet up with our fishing guide for the day. My dad had fished with Captain Xavier before and today we were searching for yellowtail snapper. 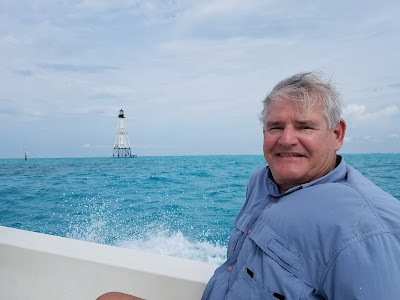 After a short boat ride to the patch reefs we dropped the anchor and put out a chum block and started fishing. Almost immediately we started catching fish. This spot was well known for its Mangrove Snapper but the reef holds a wide variety just like we saw yesterday. It's so different from New Jersey fishing. 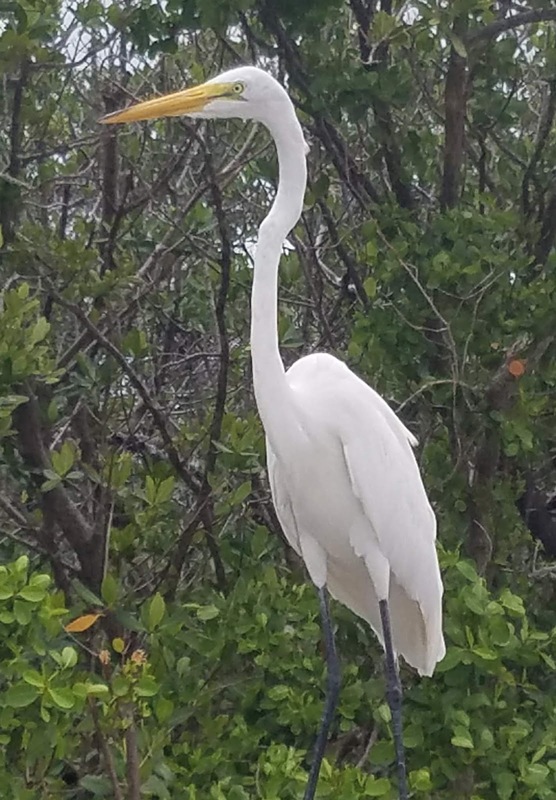 As long as you have some bait and know how to read a map of the water, you can almost always find a spot in the patch reefs that is holding fish. And these fish are hungry and willing to bite a line. Additionally, the water is so beautiful and clear. Every time I'm here I can't help wonder what the hell I am doing in New Jersey. Maybe someday I will try these exact same fishing methods in New Jersey - anchoring on some rocks or reef and drop a bag of chum in the water and see what shows up. Why not? We fished for a while in this location picking up some dinner fish. 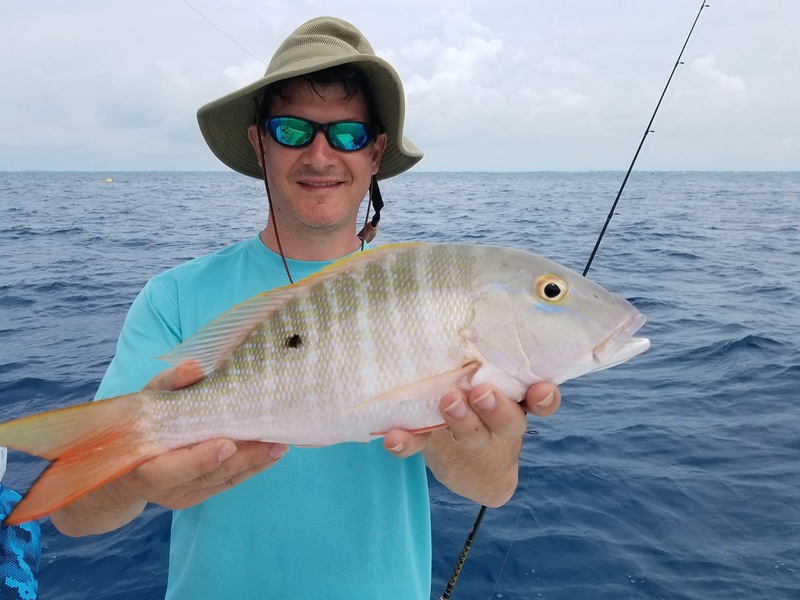 Mangrove Snapper are also called grey snapper and they are quite delicious. A few times we hooked into something much larger but it managed to take us into the rocks and eventually cut the line. I presume a large grouper was down there doing some damage to our baits. I also hooked a large nurse shark that I fought all the way to the boat before releasing. Today, the water was a little more rough and the wind was also kicking up quite a bit. It was easy to see that we would be limited in our time out on the water because of the weather. Our next spot was about a 15 minute boat ride away and in deeper water. We were out past the Islamorada Alligator Reef lighthouse in about 60 feet and we were specifically targeting yellowtail snapper. Although we were mostly unsuccessful, I managed to get one yellowtail of keeper size. I threw the cast-net on a small school of ballyhoo that gathered in our chum slick. 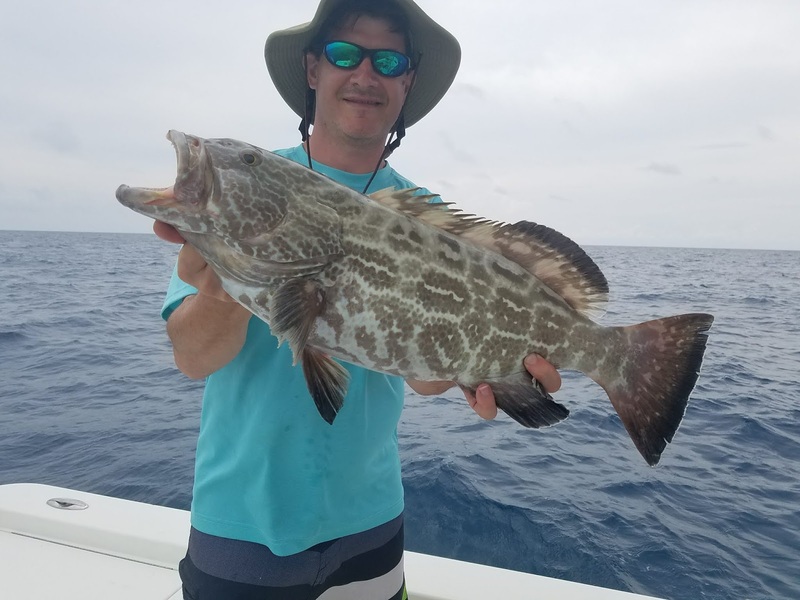 The ballyhoo made great bait for other fish lurking in the deep and I managed to catch my favorite fish of the trip - a beautiful black grouper. We made it back to the dock around 2pm. Xavier cleaned our fish while dad and I planned the rest of our day. We decided to go back to the Cheeca for a few hours to chill and snorkel the dock. There were so many lobsters and snappers and grunts under that dock. Really cool to see. I came very close to a big moray eel and a nurse shark. 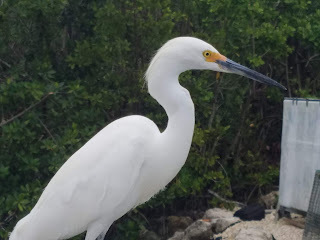 We hung out at the pool for a while - killing some time before our 5:30 dinner reservation at Ziggies Mad Dog (a popular steakhouse in Islamorada). I also visited a spearfishing shop owned by the guy who gave the lecture a couple nights ago. I talked about spearguns for a half hour and learned a lot of good info. Because our appetites had not fully returned, we decided to just share a couple things. The escargots were delicious and between the two of us we couldn't even finish one ribeye steak (again delicious). I was very leery getting 'a steak' in the Key as I planned only to eat local seafood the whole time - but dad had some fond memories of this restaurant and had a strong urge visit it once again. I tried to get snapper or grouper but their only fresh catch choices were Mahi-Mahi and Tilefish - both of which I had no interest. No conch, no stone crab claws, no Florida lobster - not the restaurant for me. Despite all that, the food we got was delicious and just the right amount to share. Continuing this long day, the plan was to drive up to Ft Lauderdale, stay overnight at the Hard Rock and then fly out very early the next morning. It was a bit of a hassle and very tiring but we got through it all without any issues. At the hotel I spent about an hour repacking all of the fresh fish (fillets and whole fish) into my cooler bag - making sure to keep everything well iced. I took very good care of the fish that we caught from both days so that it would stay as fresh as possible for the trip and for another few days at home. Against my better judgement I went to the casino and lost some money before going to bed. All in all it was a successful day and the trip was perfect from start to finish. Tomorrow morning we check out at 4am to catch a 6:30 flight back to Newark. Then, believe it or not, I have another marathon day planned as it is my 30 year high school reunion in Nutley tomorrow night! Who planned all of this?? ?